Six months into married life with a Yemenite Israeli, I have enjoyed kitniyot on passover and a henna engagement party. None of these feats, however, truly initiated me as a real Yemenite, at least in my husband's eyes, till his mother taught me how to make what is known in Israel simply as "marak timani," Yemenite soup. 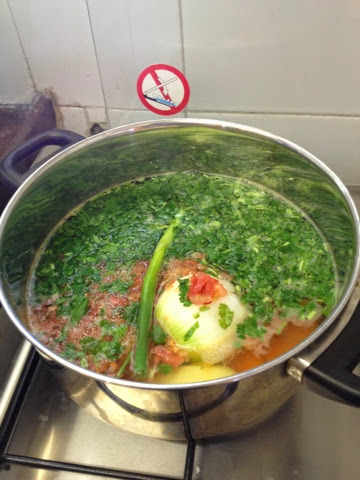 Yemenite soup needs no introduction in Israel, but for the rest of us, it is basically the Yemenite version of chicken soup. My grandma's recipe features salt and pepper; Assaf's grandma's features hawaij. Other differences from your standard ashkenazi fare: the heavy use of cilantro and the fact that entire chicken pieces get served alongside the soup; I have seen a Persian chicken soup do this too, so maybe it is a middle eastern thing (As an ashkenazi side note, my family usually uses the cooked chicken in chicken salad; my grandpa used to take the chicken fat that rose to the top and smear it on bread). With the chicken, the soup becomes a healthy, delicious entire meal, perfect for shabbat dinner, or friday lunch even in the summer. We like it anytime. 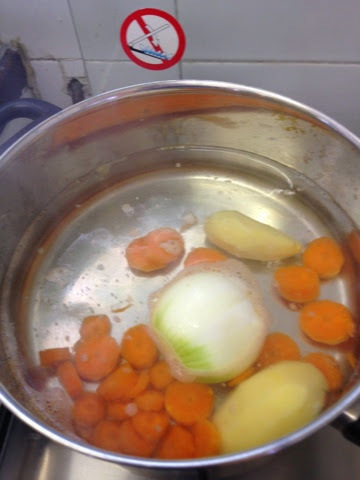 I was surprised how simple the soup was to make, though these are often famous last words. Assaf's mom said that every family's soup was a little bit different; her mom's was very basic, and she got the idea to add potatoes from Assaf's paternal grandmother. For the future (i.e. this Friday), I think I will add extra potatoes, which I love, and cut the carrot into bigger chunks the way my grandma does sometimes. I will keep the green onions in, which are particularly delicious in Israel, and a homage of sorts to the leeks that are part of my grandma's soup. So, without further adieu, how you, too, can make this surprisingly simple, thoroughly tasty soup. Pictures to come. 1 1/2 Tbs. Hawaij Marak (i.e. for soup--there is also for coffee/tea and apparently for baking), or to taste. We bought ours from the shuk, but Assaf's aunt makes it at home. 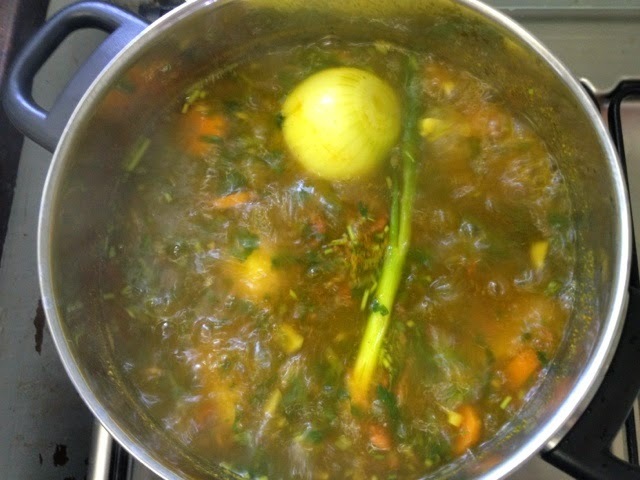 Assaf's mother said her mother sometimes would just add the various spices separately into the soup. Parsley chopped fine without stems. Tip from Assaf's mom: the celery and parsley, and possibly the cilantro, can be blitzed together and pureed, and then added to the soup. 2. 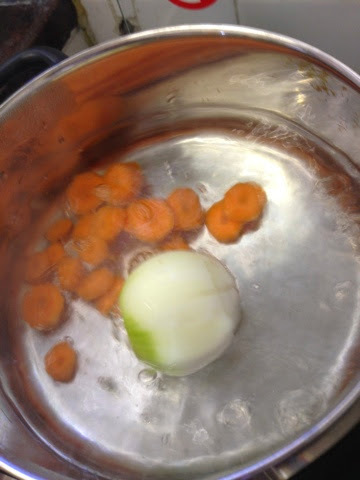 Add onion, carrots, potatoes, herbs, the tomato, garlic, 1 1/2 tablespoons hawaij (or to taste), a teaspoon of salt (taste the soup later on to check if it needs more), and green onion and cook on medium. I think at this point you should cover it. You can add the ingredients as they are ready, and the order itself seems flexible, but I would suggest added the potatoes first so they have time to cook. 3. 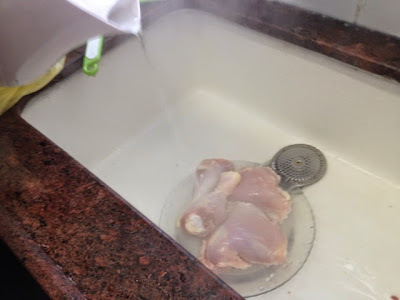 In the meanwhile, place the cleaned, skinless chicken in a dish in the sink and pour boiling water on it. I forget why, but this is important. 4. When the potato is soft, add the chicken. You do not want to cook the chicken till the potato is soft and yields to a toothpick, as apparently the potato will absorb the chicken's flavor. Place the chicken on the bottom of the pot, covered with soup. 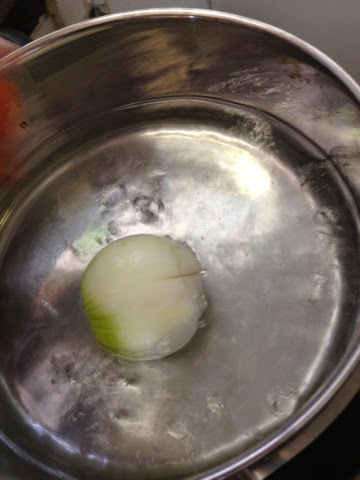 You can add more boiled water if you want more broth. 5. Cover partially and cook till chicken is very tender, about 30-60 minutes. I didn't stir, and I don't think you are supposed to. Yemenite pita (Saluf) or regular oversized pita, hilbeh sauce, schug on the side, as desired. Place broth and whatever veggies (not everyone loves the onion, but I do) you want in a soup bowl, and add a piece of chicken. 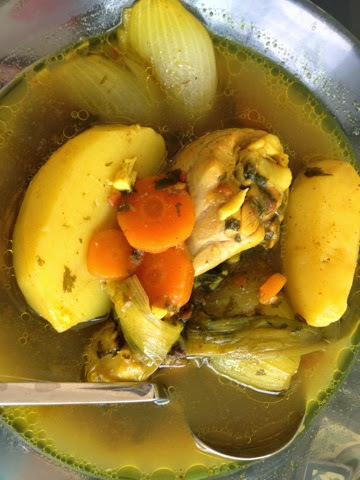 Yemenite soup is eaten with the entire piece (a whole drumstick, for example), but since the chicken is so tender from all of the cooking time, it comes easily off the bone with the spoon. I'm just sitting in my cubicle, wiping drool off of my face. ps wait till you see the pics!! !